This weird thing is happening, and I’m not totally sure what to do about it. And the weird thing is, as I get older, I have more responsibility. And the worst part is with more responsibility and things going on, sometimes my “life” gets in the way of my working out! There was a time and day in the past where I never, ever would’ve missed a workout. Colts game on TV? Who cares, I gotta bench. Go out to eat with friends? Not on squat day. Sorry bra. Hang out with my special lady? Sorry honey, you understand. A man’s gotta pull! I’m sure some might say I’m not focused or dedicated enough, and that training has to be the priority. And I get that mindset – trust me, I do. But for those of us that sit squarely on the fence, who are serious about training, but also respect the fact that’s it just one component of who we are as human beings, let’s talk about Punch the Clock Workouts. Just like a man or woman gets paid to clock in from 9-5, sometimes, that’s how we have to approach our training. Let’s briefly explore three of my favorite types of PTC workouts, and see if any of them can help you stay on track with your strength, physique or athletic-related goals! Let’s say you haven’t been in the gym for a month. You’re a little overweight, out-of-shape, and you feel like a big stinkin’ piece of poo. Rather than go in and try to “crush it,” I’d use a foam rolling and mobility related warm-up to get you back in the game. Go in and foam roll everything from your head to your big toe. Now do the same thing with your mobility exercises. There doesn’t have to be a rhyme-or-reason to any of it. This type of workout is also fantastic for those days when you really don’t feel like working out. It’s been a grueling week, and you’ve put in 50 hours behind the desk and it’s only Thursday! I can tell you this much from personal experience – some of these workouts where my only goal is to warm-up, end up being some of the best training sessions of my life. You go in with no real aspirations of setting the world on fire, and by the time you’re warmed up, you’re shocked to find out you’re actually feeling pretty good and ready to train. Whether you just do the warm-up, or end up making it through the entire training session, sometimes just doing something will make you feel better and keep you focused on the big picture. One thing I love about Jim Wendler is his ability to make things clear and easy. In his book 5-3-1: The Simplest and Most Effective Training System for Raw Strength, Wendler talks about how there are some days when you just don’t feeling like training all that hard. And it really doesn’t matter why you don’t’ feel like pushing yourself; you just don’t! 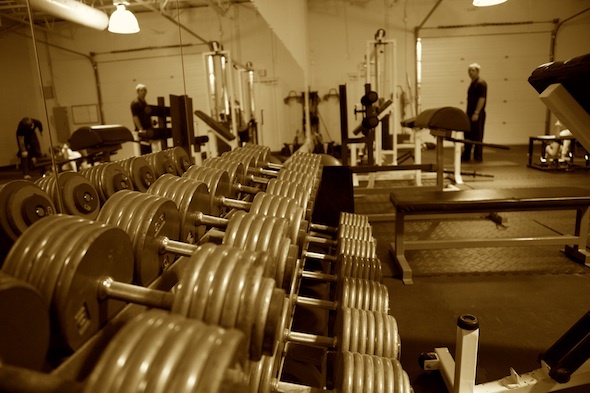 In this case, your only goal for the day is to go in, warm-up, and get your main lift(s) in for that day. Even if you’re supposed to back squat, board press, lunge, etc., you’re going to go in and squat, and then go right back home. Again, sometimes this simple trick is all that’s necessary to pull you through the rest of the workout. You get through the squats, they go better than expected, and then you finish up as planned. But even if you don’t, getting that first lift in for the day is the single most important thing you’re going to do in that training session, so get that in and then move on with life! No, I’m not talking about Tim Ferriss’ video blog (although that’s a good watch, too). The random workout is just that – random. Let’s say you’re a powerlifter and your only goal is to push-up those big three lifts. But you’ve been grinding for months on end, don’t have a planned meet, and simply need to do something different. Instead of benching heavy, do some mixed cardiac output work my pressing the dragging sled, pushing the Prowler, or even getting a little work in with the battling ropes. Or maybe take a bootcamp class to get you doing some different movements, and use some different muscle groups. Or as I mentioned above, you could just go in and do a ton of self-myofascial release and mobility work to make sure you feel great for your next training session. As the saying goes, “variety is the spice of life.” If you’ve had your nose to the grindstone for months on end, sometimes a small change of pace can go a long way to kick-starting your progress, or re-focusing you on your goals. While this wasn’t mean to be an all-encompassing guide on PTC workouts, I hope I’ve at least given you some food for thought. Not every training session has to set the world on fire, and you’re not really expected to hit a PR every single day. Sometimes, just the simple act of getting in the gym and doing something is the most important thing you can do for yourself. Great post Mike. I can absolutely relate as there are some days you just feel beat up from life, training, etc. but still want to get some work in. I believe Dan John talks about a similar concept in the “Rule of Five” chapter in Never Let Go. I knew Dan John had probably mentioned something like this in the past. I could probably cite him in some way, shape or form on everything I write. Great post Mike! I know everyone who works as a fitness professional can relate to this. In my opinion, this is something I need more of to prevent burn-out (like you said trying to set the world on fire every workout). I was the same way. I can remember getting up early on Thanksgiving because it was squat day. 2 sets of twins later and I am lucky to lift 3 days per week for 45 mins. During the summer its even worse. Priorities certainly change and for the better. I used to be at the gym and nobody better even look at me wrong. Now I take my kids to my gym with me and they run around and swing on the blast straps, throw the medicine balls, and clean and press the broke curl bar. I stop my sets to watch them jump on the squat boxes and over the platforms. And I still at least look like I know where the weight room is so its ok.